Developmental co-ordination disorder (DCD), also known as dyspraxia, is a condition affecting physical co-ordination that causes a child to perform less well than expected for his or her age in daily activities and appear to move clumsily. The problem is not due to general delays in development or a learning disability, and is not caused by cerebral palsy or another neurological disorder (conditions affecting the nervous system). Although signs of the condition are present from an early age, children vary widely in their rate of development and DCD is not usually definitely diagnosed until a child with the condition is around five years old or more. visual perception problems related to development of the eye muscles. The charity Young Minds says the number of children experiencing the condition is between 2% and 10% of the population. Boys are four times more likely to have dyspraxia than girls and the NHS says it may run in families. Experts believe the condition is caused by the brain's information processing systems not being fully developed and messages not being transmitted properly. Although not fully understood, the risk of dyspraxia may be higher in babies born prematurely, born with a low birth weight or whose mother drank alcohol, smoked or took illegal drugs during pregnancy. Speaking and listening, social skills and friendships. Early signs of dyspraxia may be seen in babies who are slow to sit up, crawl, walk and get the hang of potty and toilet training. Later in life, children may seem awkward and accident prone and take longer to learn to ride a bike. They may be oversensitive to some noises, light, touch and other triggers. Speech may be immature for a child's age and hard to understand early on. As well as communication difficulties, a child with dyspraxia may think in a very literal way and have trouble with imaginative play. 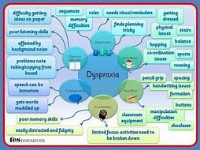 A child with dyspraxia may have other learning difficulties, such as an autistic spectrum disorder, attention deficit hyperactivity disorder (ADHD) or dyslexia. The symptoms of dyspraxia may fade as a child gets older, but around nine out of 10 children with dyspraxia still have difficulties in their teens and adulthood. If a child already has diagnosed learning difficulty, the motor skills are worse than expected for this condition.